When Marriott and SPG announced their merger, many fans of both hotel companies around the world thought immediately about rewards and points, service and corporate culture. Not me, no, instead my first thoughts went to the new-to-me properties I would soon be enjoying. While I’m certainly not exclusive to Marriott, they’ve been a favorite travel company for a very long time, which is one of many reasons why I was so thrilled when they agreed to sponsor my epic Route 66 drive from Chicago to Santa Monica. Each night I stayed with a different Marriott International brand, experiencing the best the company has to offer at every price point and style of hotel. 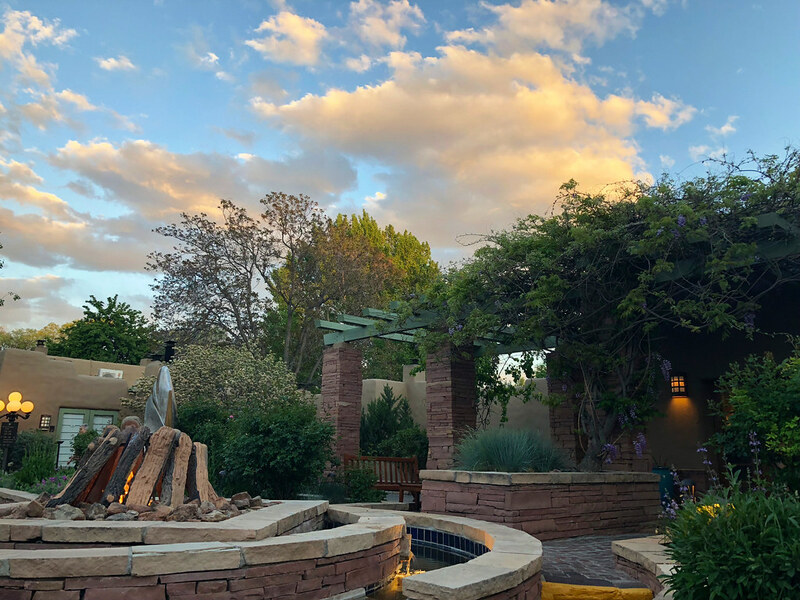 One of my favorite experiences though was at the Tribute Portfolio hotel in Santa Fe, New Mexico – La Posada de Santa Fe Resort and Spa. While I was excited to experience the entirety of Route 66, I was especially looking forward to the Southwest legs of the trip. I’d never really spent any time in this, one of the country’s great treasures, and I had never even step foot in New Mexico before. So when it came time to plan the adventure, I made sure that we spent a couple of extra days in one of the state’s great cities, Santa Fe. With a history that goes back more than 400 years, Santa Fe is totally unlike any other city I’ve visited. Every building seems to be made out of adobe and there’s a certain international flair that shines just out of sight. It’s a famously artistic and liberal enclave in the state, most of which is rural and somewhat disconnected. Santa Fe though felt more like an expat community in Mexico or elsewhere, its Spanish heritage also embraced and on full display. 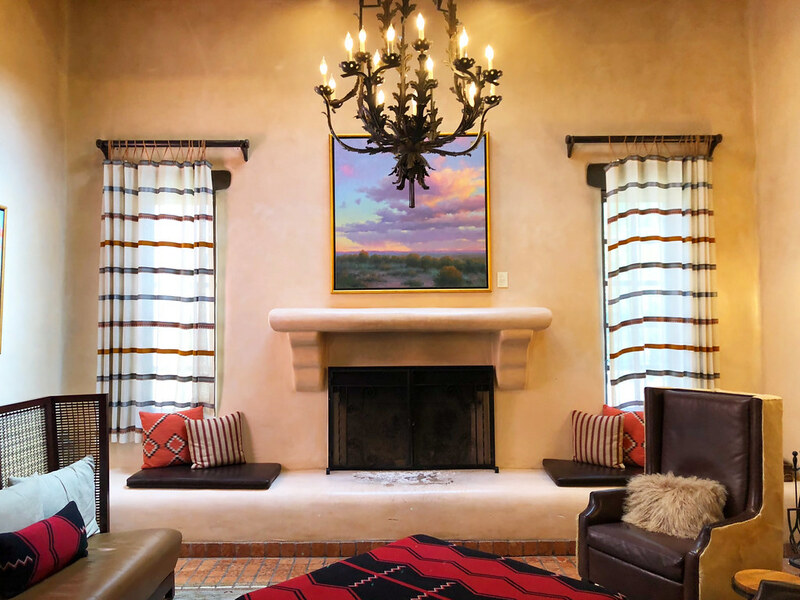 This naturally carries through to La Posada de Santa Fe, a historic property adjacent to the city’s old town that relishes in this Spanish colonial flair. 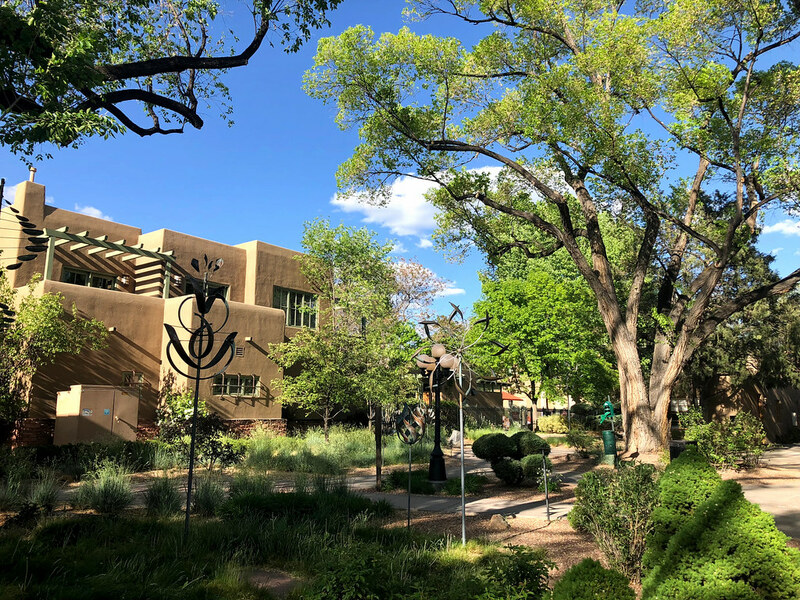 Located on six historically rich acres in downtown Santa Fe, the luxury hotel started life as an 1880s brick mansion, built by prosperous German immigrants to the city. In the 1930s, new owners started the process of converting the entire property to a resort, building adobe casitas and enhancing the services. Over the years this enhancement continued to create the historic but modern, stylish but incredibly comfortable luxury hotel that La Posada is today. Style and design is actually an important part of the guest experience, not only enjoying time in those gorgeous casita suites, but also admiring the artwork throughout the resort. 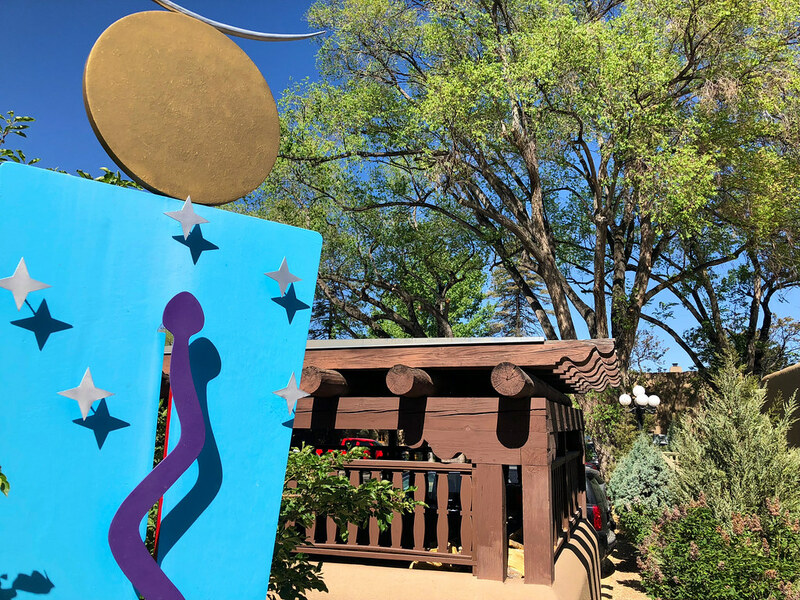 La Posada was one of the first businesses to showcase artwork in Santa Fe, which seems incredible given that today every other business in town seems to be an art gallery. They’ve continued this rich artistic tradition and have a full-time art curator on staff who continuously adds new pieces to the collection, all of which are for sale. The art ranges from traditional landscapes to more avant-garde sculptures and mobiles, all of which come together to enhance the already pastoral and relaxing feeling of the retreat. It’s rare for me to feel relaxed when I travel, especially on an intense trip like Route 66. Yet that’s exactly how I felt throughout the two-days at La Posada de Santa Fe, happy, content and relaxed. That’s probably also why I didn’t want to leave, but part of that reason also involved the many amenities offered to guests at the hotel. 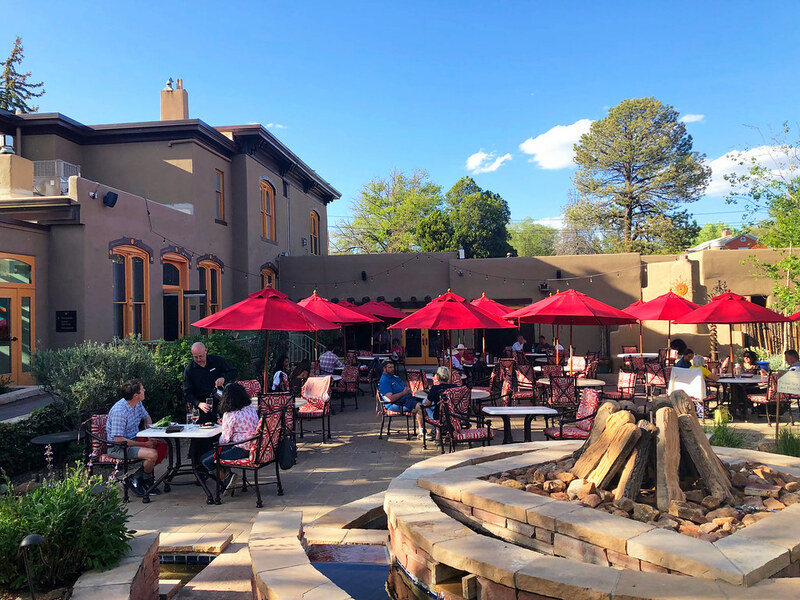 As one would expect in the creative city of Santa Fe, the culinary arts are an important element of La Posada, from more formal restaurant options to low-key dining on their al fresco patio. 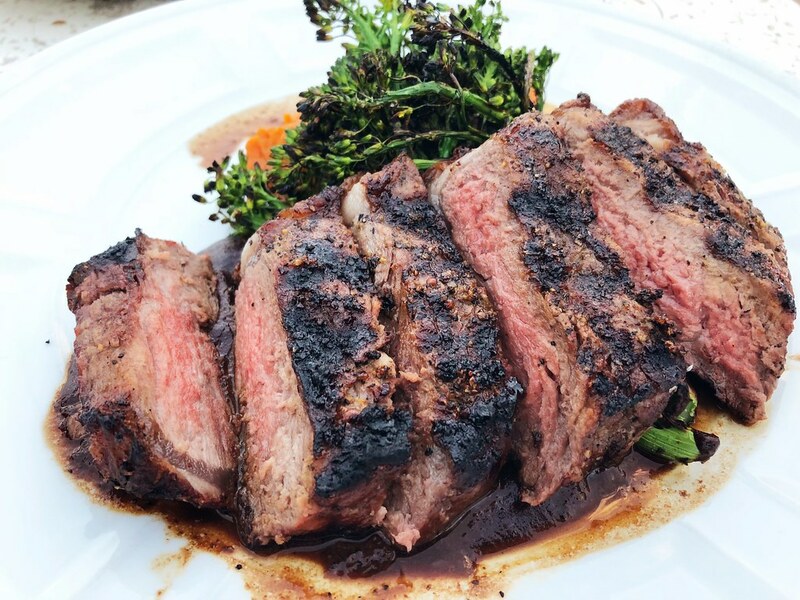 Since the weather was absolutely perfect throughout my stay, the patio and I got to know each other well, enhanced by an expansive and intensely creative menu. Adding local flair to nearly every dish, the food aspect of staying at La Posada adds a lot to the overall experience; just make sure you try the many chile-enhanced options. Whether it’s a new way to present deviled eggs or an incredible coffee encrusted steak with mole sauce, it’s impossible to go wrong. That commitment to excellence carries on to all aspects of the stay, from front desk staff to the famous spa that draws people from all over the country. Spas and I have a mixed track record to be honest; I usually stress out that I’m not relaxing enough. Yet not even I could resist a 90-minute facial and massage, after which I melted into putty ready to do little more than lounge by the pool all day. La Posada de Santa Fe has everything I look for in any great luxury hotel. Outstanding service, food and style but also an interesting and unique history. 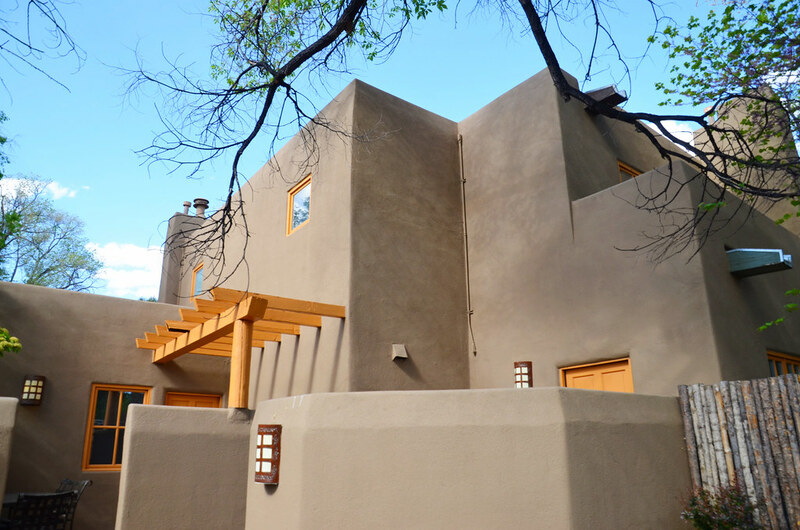 This is as far from a cookie cutter experience as you could hope for and since it’s a 2-minute walk from historic Santa Fe, La Posada truly is the ideal place to not only enjoy the best the city has to offer, but to do so in comfort and peace.